Thirty-five states across the country have toll roads—that's 70 percent of the United States. If you live in one of these states, you likely own a toll pass so that you can just roll through toll booths without needing to stop and pay each time. The smarter way to go is to bring along your own toll pass, but not all toll passes are created equal. If you're driving in many states on the East Coast or the Midwest—a NC Quick Pass from North Carolina is the best-value toll pass you can buy. Car rental companies charge through the nose for electronic toll billing programs such as E-ZPass or FasTrak. Between the tolls themselves and surcharges from the rental companies, opting for a toll transponder is never a moneywise deal. Toll surcharges generally run between about $4 and $12 per day, depending on the rental car company—plus the tolls, of course. A smarter strategy is to bring along your own toll pass, and North Carolina is actually a great resource for buying one. In fact, it might be the best in the country, even if you never encounter a North Carolina toll road. It works in 18 states—all 15 E-ZPass member states plus North Carolina, Georgia, and Florida. It's the cheapest toll pass option that works in 18 states (a compatible transponder starts at $7.40, and there aren't any monthly account fees). It's the only major toll pass that also offers an option for toll-free travel on Washington, DC-area high-occupancy vehicle (HOV) lanes. These restricted traffic lanes are normally reserved for the exclusive use of vehicles with multiple passengers, including carpools and transit buses. These restrictions may be only imposed during at peak travel times or may apply at all times. 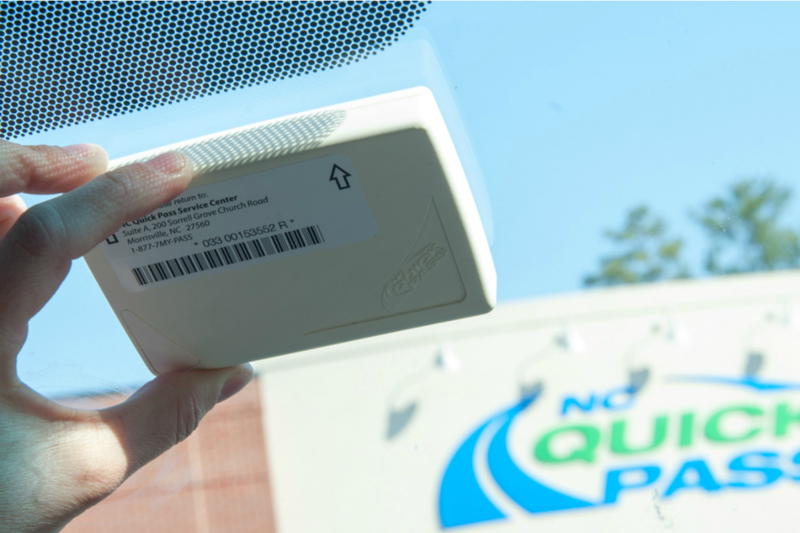 The NC Quick Pass Interior Sticker is free, but it permanently attaches to your windshield, so it's not an ideal choice for a rental car. Also, it only works in the southeastern US (North Carolina, Georgia, and Florida). The NC Quick Pass E-ZPass Transponder costs $7.49. It's portable and works in all 18 reciprocal states (the 15 E-ZPass states in the Northeastern US and three southeastern states with electronic toll roads). The NC Quick Pass E-ZPass Flex Transponder is the most expensive option at $16.49. It works in all 18 reciprocal states. It also includes an "HOV ON" switch, which lets you travel toll-free in certain carpool lanes and roads in North Carolina and Northern Virginia. This is especially helpful if you're traveling in the Washington, DC area, where I-66, the main route between DC's Virginia suburbs (including Dulles airport) and Washington, is restricted and tolled during commute hours. There aren't any maintenance costs or monthly fees, and the opening balance requirement is a reasonable $20, which is immediately usable as credit towards toll charges. Comparing the NC Quick Pass E-ZPass to other portable (non-sticker) transponder options, it's easy to see why the NC Quick Pass is a good deal. For travel in E-ZPass states, we've previously recommended the E-ZPass issued by Massachusetts, since it doesn't have any monthly fees or transponder costs. But it doesn't work in the southeastern US—and since Florida is such a major travel destination, you're likely to find yourself traveling there sooner or later. Ironically, one state most rental car drivers will not need a toll pass is North Carolina. There are only two tolled routes in North Carolina today: the Triangle Expressway near Cary and the Monroe Expressway near Monroe, in Charlotte's southeastern suburbs. Both are primarily used by suburban commuters, so tourists generally aren't bound to run into them. A third stretch is currently under construction in the median of Interstate 77 through Charlotte. Known as the I-77 Express project, these lanes will offer faster travel at peak times for travelers willing to pay extra. They're scheduled to open in the first part of 2019, but they won't replace any existing lanes on I- 77, so travelers won't be required to use them. Fortunately, North Carolina doesn't toll traffic on any bridges today. That means that popular tourist destinations like the Outer Banks and beaches near Wilmington are free to travel to. If you rent a car and do find yourself needing to drive on one of these toll roads in North Carolina, not to worry: while cash isn't accepted, all of the major rental car companies offer options for toll passes in North Carolina. For travel in the southeastern US, we've recommended the E-PASS issued by the Central Florida Expressway Authority. The basic southeastern-US-only portable option that you can take out of your rental car is $9.95, and the portable expanded E-ZPass-compatible option is $18.50. But for less than half the cost ($7.49) of a portable E-ZPass-compatible E-PASS, you can get the exact same functionality from a NC Quick Pass E-ZPass transponder. And E-PASS doesn't offer an option that'll work in DC's HOV lanes; North Carolina's option that does cover HOV lanes is cheaper than the E-PASS option that doesn't. For free travel on Interstate 66 in Virginia—the main way to get into Washington from Northern Virginia suburbs like Falls Church, Fairfax, Reston, and Dulles—the only other option is an E-ZPass Flex issued by Virginia. While they're free to order, you'll be charged $10 if you don't use an HOV lane in Virginia at least once a year. Plus, it doesn't work in the southeastern US. You can bring any of these transponders (except the free sticker-only version) with you when you rent a car. That can save you up to $12 per day (depending on the rental company and location) on rental car toll pass fees. The bottom line: if you foresee future road travel in a number of states in the East or Midwest, the simplest and cheapest way to cover all tolls in these areas is a NC Quick Pass E-ZPass transponder for $7.49. And if you at all foresee traveling in the DC metro area with other people in your car, the small upgrade to the NC Quick Pass E-ZPass Flex transponder for $16.49 can save you from a massive headache—or a massive toll—trying to fight traffic in Northern Virginia. Can You Use Your E-ZPass in a Rental Car?